Annaliese Meyer, an undergraduate student in microbiology at the University of Victoria in British Columbia, used her CABIOS internship (under the guidance of faculty member Damian Grundle) to research rare earth elements and their role in methane cycling in the ocean. Her work at sea near BIOS included deploying a CTD instrument, which stands for conductivity (or salinity), temperature, and depth, and refers to a package of instruments that measure these properties. Since its inception in the 1970s, the Canadian Associates of BIOS (CABIOS) program has provided more than 200 Canadian students and young scientists with financial assistance to pursue marine science and oceanographic research internships, as well as support for hundreds of students to complete academic coursework at BIOS. Founded by Earlston Doe, a former BIOS Life Trustee and Canadian oceanographer born in Bermuda, the CABIOS fund honors the memory of his youngest son Learmont “Leary” Doe. In the decades following its formation, CABIOS received annual support from numerous individuals, businesses, and organizations, including several donations that allowed the fund to grow and diversify. Today, through partnerships with a variety of Canadian universities—including Dalhousie University, Trent University, McGill University, the University of Guelph, and the University of Toronto—CABIOS supports multiple Canadian students each year, allowing them to take summer courses or pursue internships at the Institute. In the fall of 2018, BIOS faculty member Damian Grundle used CABIOS funds to support internships for two students from his alma mater, the University of Victoria in British Columbia. 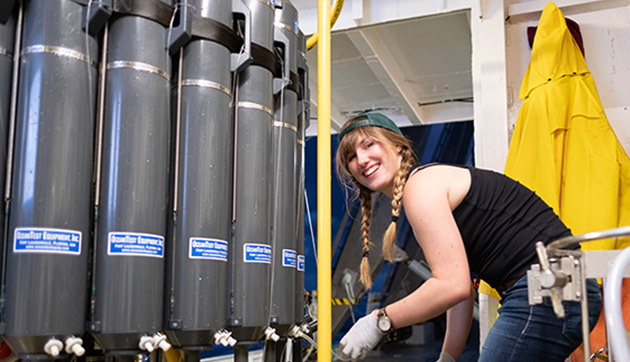 Annaliese Meyer, an undergraduate student in microbiology, focused her research at BIOS around rare earth elements and their role in methane cycling in the ocean. “Methane cycling has recently been in the spotlight, as it has major impacts as a significant contributor to the greenhouse effect,” she said. Despite their name, rare earth elements—including cerium, lanthanum, and neodymium—are abundant in Earth’s crust. Up until the early part of this century, rare earth elements were generally thought to play an insignificant role in biological processes. But in 2014, bacteria were isolated from a volcanic mud pot, a type of acidic hot spring, in Italy. These bacteria, known as bacterial methanotrophs for their need to metabolize methane for life, were shown to require rare earth elements for growth. “That was the tipping point for a renewed interest in rare earth elements from a biological standpoint,” Meyer said. Additionally, there is a growing need to understand biological methods of methane sequestration, or how methane is “fixed” and removed from Earth’s atmosphere. It has been found that a key enzyme in the methane oxidation pathway has two variants in most, if not all, bacterial methanotrophs. One of these variants requires a rare earth element to catalyze key biological reactions. At the University of Victoria, Meyer works in a trace metal chemistry laboratory. She and her mentor, Jay Cullen, study the distribution of trace metals in the ocean, particularly those that have biological function. These metals act as “micronutrients” for marine life and are often the limiting factor in locations that are otherwise ideal for primary production and life. Outside of her oceanographic research, Meyer is a member of the University’s rocketry team. As a team leader, she helps to design payload experiments flown on board student-designed and built sounding rockets that reach heights of up to 30,000 feet (9,100 meters). Shea Wyatt, who is currently in his second year of graduate studies at the University of Victoria, studies diatoms, a group of phytoplankton with hard outer shells made of silica—essentially biologically-produced glass. During his CABIOS internship with Damian Grundle, he participated on cruises to the BATS site to conduct research on diatoms. Shea Wyatt, a former biologist and high school math and science teacher, is currently in his second year of graduate studies at the University of Victoria with advisor Diana Varela where he studies diatoms, a group of phytoplankton with hard outer shells made of silica—essentially biologically-produced glass. Specifically, he investigates the effects of ocean acidification on the shell-growth process, known as silicification. He uses field and lab experiments to simulate potential future atmospheric conditions with high levels of carbon dioxide. These lab experiments are conducted at the University of Victoria using individual species of diatoms collected from the west coast of Canada. So far, field experiments have taken place during a three-week cruise in July that started in Victoria, British Columbia, and ended in Barrow, Alaska, as well as during a similar experiment conducted at BIOS. In addition to the ocean acidification experiments, Wyatt is interested in the spatial and temporal trends of diatom silicification in the ocean (or how shell development changes over time and in different regions of the ocean and water column). This is part of ongoing work to refine understanding of the marine biogeochemical cycle of silica. During the summer of 2017 he completed surveys in both the Bering and Chukchi Seas. The goal of the surveys was to determine rates of silica production and to couple those measurements to carbon fixation and nitrogen use by phytoplankton, as well as concentrations of particulate silica and chlorophyll. “These two different regions of study are about as different as you can get in the ocean,” he said, comparing the Bering and Chukchi Seas with the Sargasso Sea surrounding BIOS. “The Bering and Chukchi Seas are relatively shallow, very cold, rich in nutrients, and absolutely teeming with life in the summer months,” he said. Conversely, the North Atlantic Ocean around Bermuda is very deep, very warm, and relatively poor in nutrients. 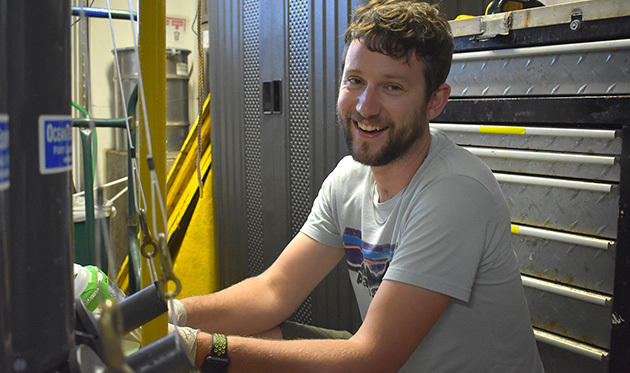 By comparing the results of two similar studies in such different areas, Wyatt said he hopes to determine how the biological mechanisms of silicification differ under changing global climate conditions, and to improve the understanding of broader trends of primary production, and the silica cycle, throughout the ocean. Applications for the 2019 CABIOS internships are due March 15. Questions may be directed to education@bios.edu.